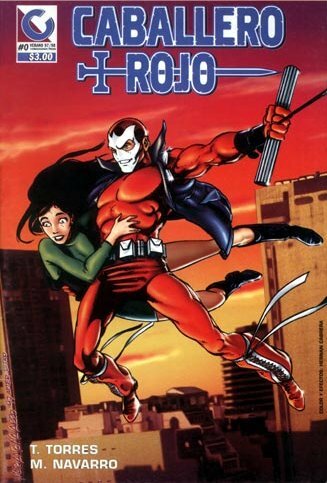 Powers/Abilities: Very acrobatic, employs some sort of grappling line to swing between buildings. Uses smoke bombs and throwing baldes. History: The Caballero Rojo is the inheritor of 900 years of tradition, of a masked paladin of justice known as The Caballero Rojo. In the 1940's the current incumbant's grandfather was the last to hold the name. Crippled in the 1950s by a bullet to the spine, he was disappointed when his son Humberto decided not to take up the family tradition (largely because of his father being injured). However his grandson had a different attitude, and the wheel-chair bound former superhero secretly trained him from an early age. Now a modern version of this hero has arisen to defend the innocent of Argentina, the 34th man to don the mantle of the Caballero Rojo. Comments: Created by T.Torres and M. Navarro. Cabelerro Rojo translates more literally as "Red Horseman", but I've been assured Red Knight is more in keeping with the character.